Hello friends! 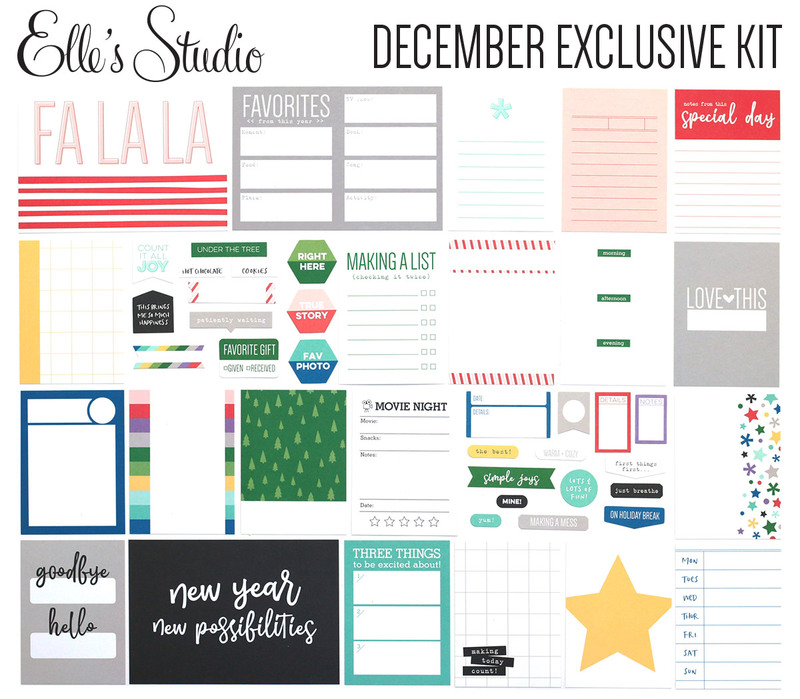 I'm here sharing my FINAL layouts for Elle's Studio! It's been such a wonderful two years, and I'm truly honored to have been a part of such a talented team using Elle's AWESOME products! The December release was my last as a part of the team, and I couldn't have imagined a better way to go! The products this much are nothing short of amazing, and I loved creating with them. 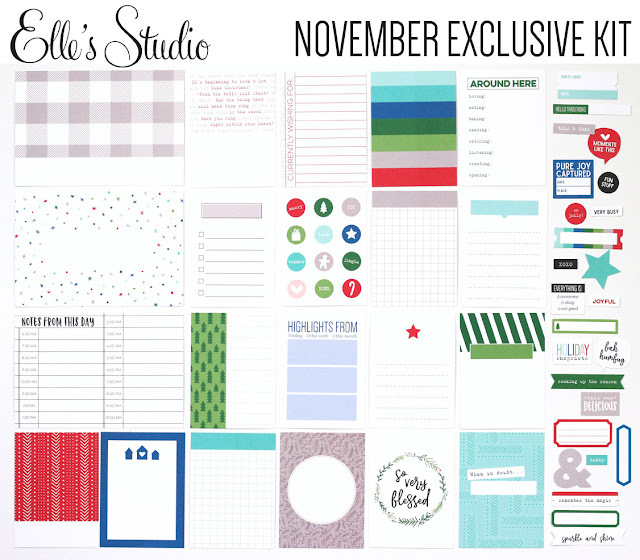 Here's a look at the layouts I created! 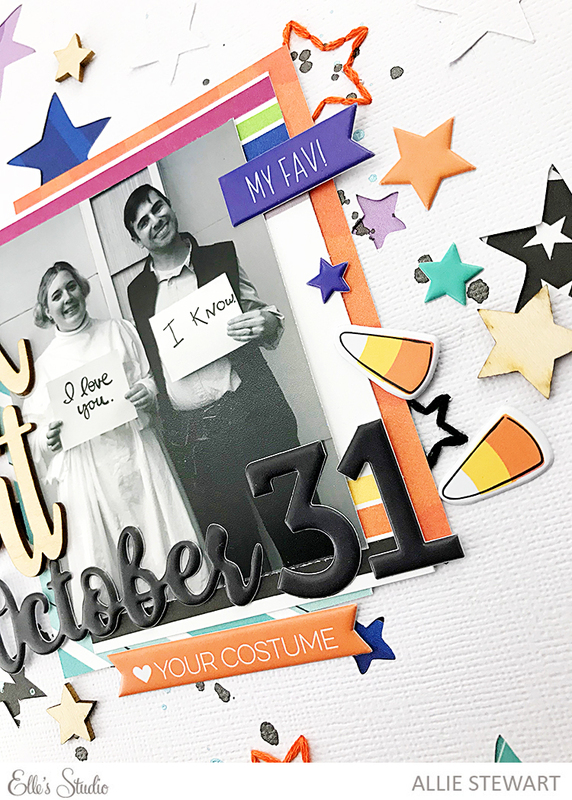 For this first layout, I was so in love with the puffy stickers released this month, that I created a whole layout based around them. I used the December cut file that had the same shapes on half of my page. 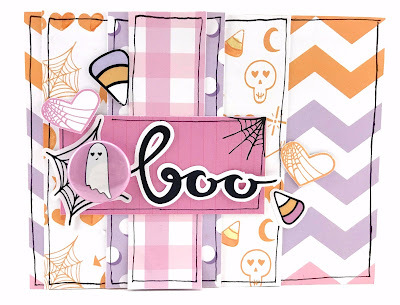 I added the puffy stickers and the white cut outs on the other part of the page and had a really awesome background! 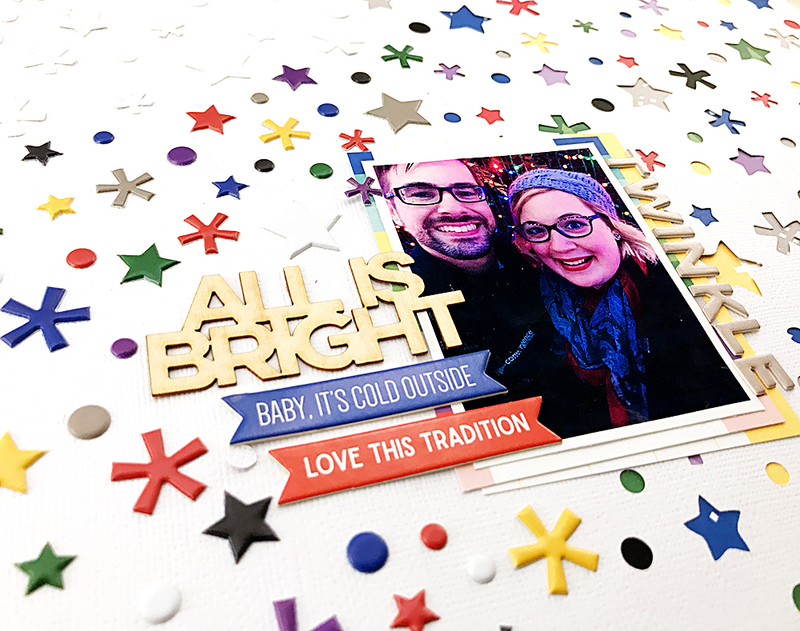 For my second layout, I used the Document December kit to create a festive page. 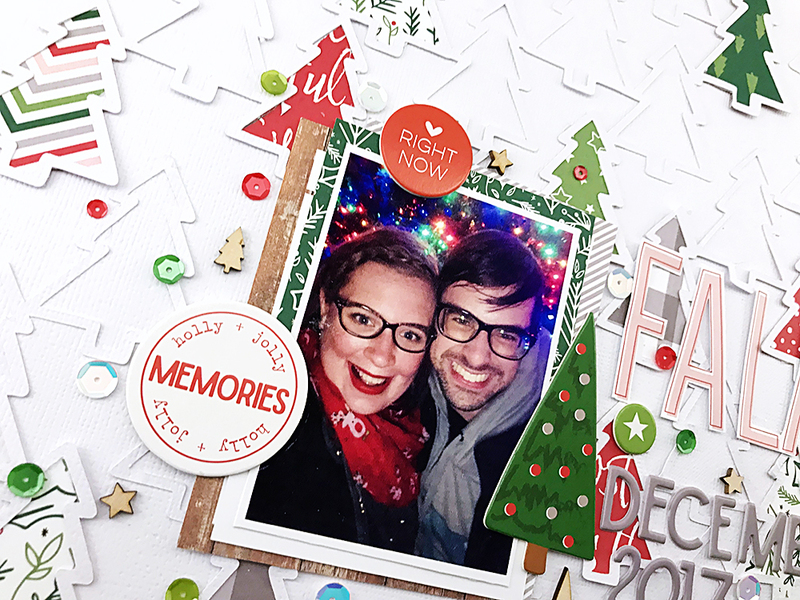 I used a Christmas tree cut file from the Silhouette studio as my background. I backed random trees throughout the design with papers from the Document December kit. 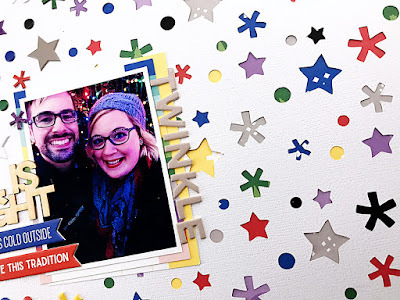 Next, I grabbed some 3"x4" cards from the December kit for photo layers. 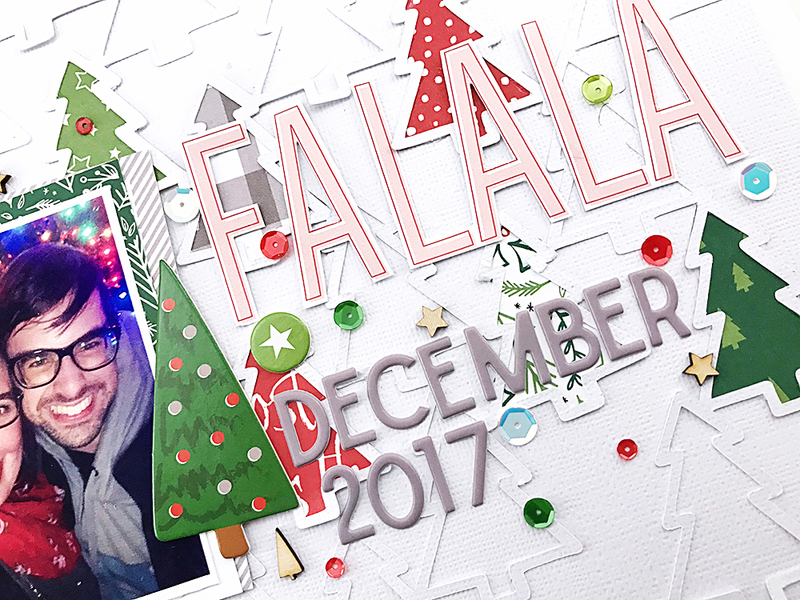 I cut the "Fa La La" cut file from a 4"x6" journaling card for the title, and added a puffy sticker subtitle. 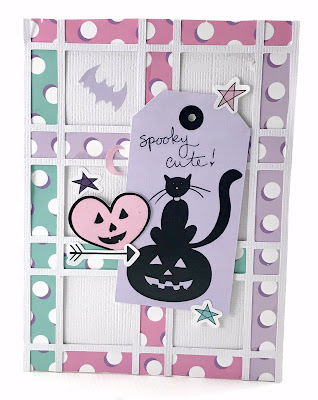 Next, I finished off with a few pieces of the adorable chipboard and the sequin/wood shapes mix! So fun! 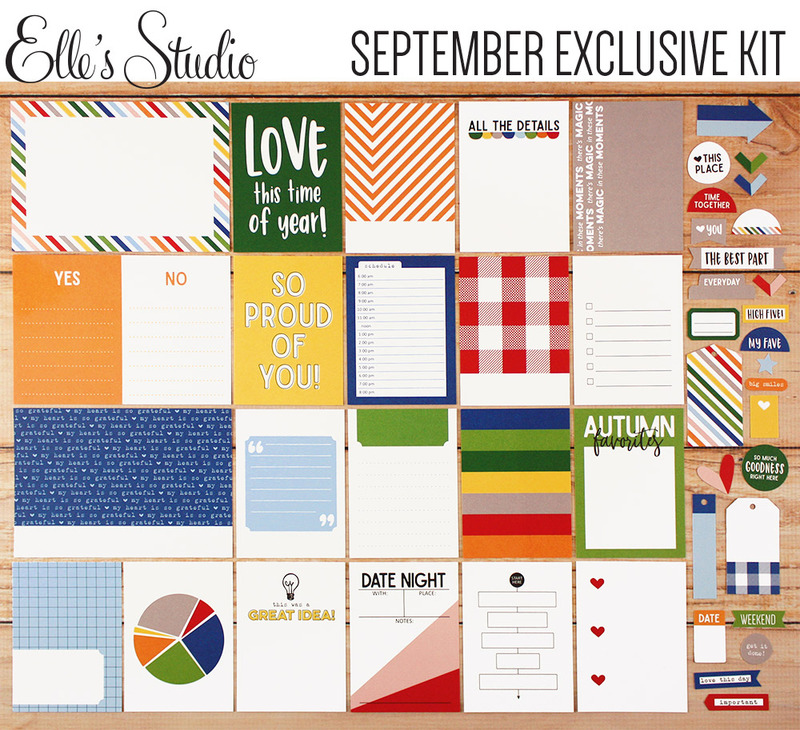 If you're interested in subscribing to the kits, all subscribers get a special gift this month! Subscribing also allows you to lock in lower prices for the kits, and special access to sales! Thank you for joining me for these past two years! It's been a blast! Hello there! I can't believe it's November already, and nearly Thanksgiving! This is my favorite time of year! I have my tree up already and I'm heading out to do some more Christmas shopping today. Like always, I love all the fun new stuff in this month's Elle's Studio release! 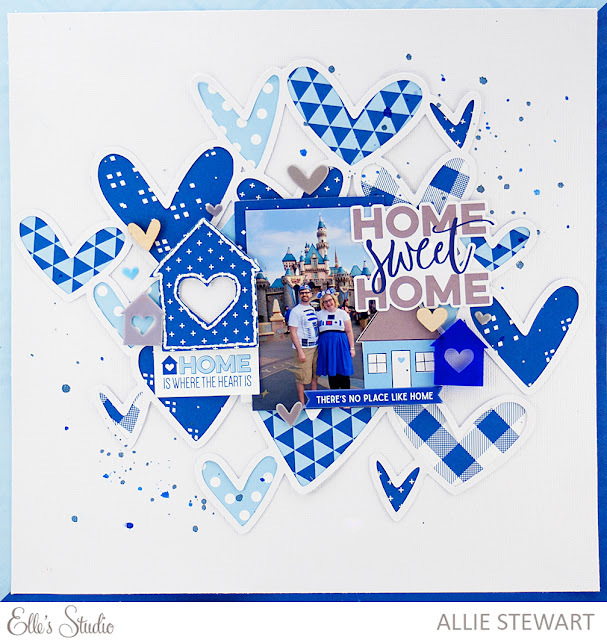 My first layout is all about blue! I used the Heart Clusters cut file and backed the hearts with blue papers from the Family Fun collection. I added some mist splatters, and grabbed all the home/house elements I could find. I used the November cut file to cut out the little house, and stitched around it. I added my photo and surrounded it with all the house elements, as well as my title. I finished with a few hearts! My next layout is all about the snowflakes! I used the November cut file to cut out snowflakes from white cardstock, and backed them all with vellum. 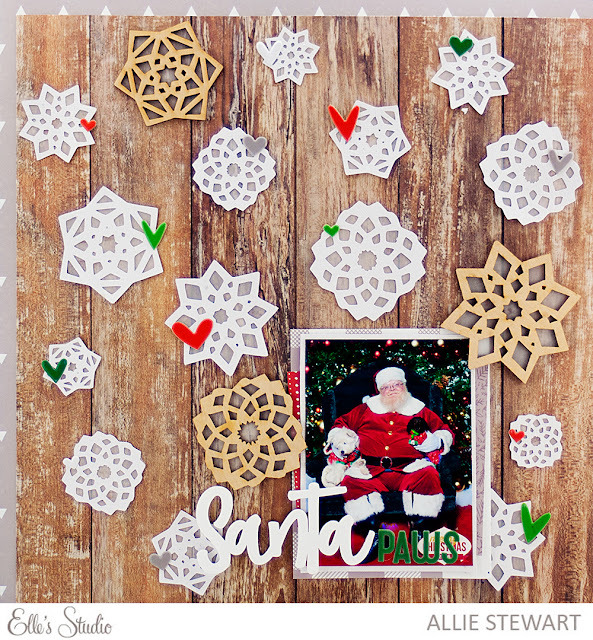 I arranged the die cut snowflakes and wood snowflakes across the page to create a background. I added puffy hearts on each snow flake, and used the adorable Santa acrylic as a title! I love the way it turned out. Here's a look at all the awesome products I used! If you'd like more info on subscribing to the kits, and all the great benefits, be sure to check out the Elle's Studio site! Thanks for joining me! Hello there! Tomorrow is Halloween and I have some spooky fun cards to share using the This is Halloween kit from the Fairytale Club. For this first card, I covered the background in patterned paper, and added smaller rectangle, and so on, and so on, so I created a layered look with a focal point. 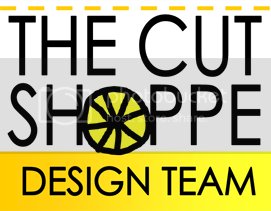 I added a tag, to help the sentiment stand out, as well as some die cuts and flair. 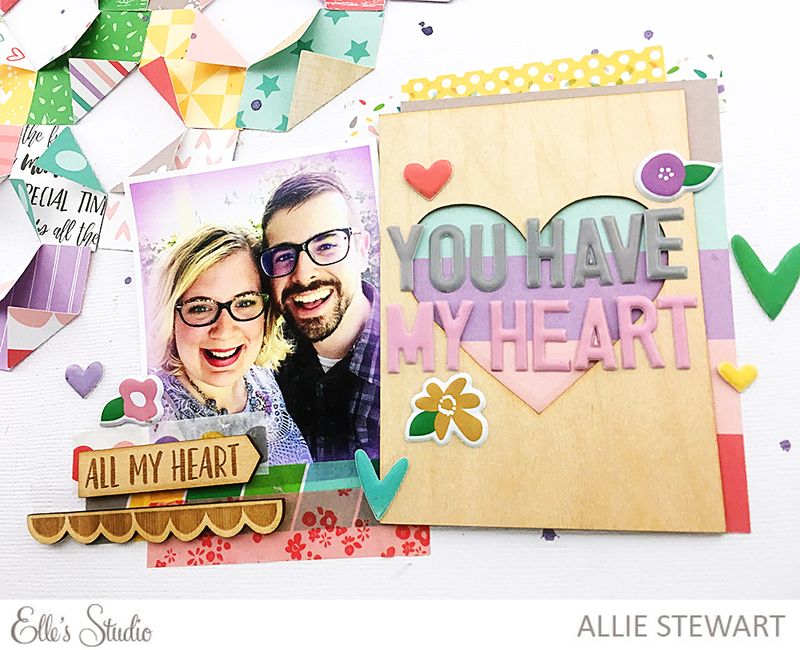 For my next card, I added patterned paper to the background, and stitched the fun heart transparency over it. I added a doily to help the tag pop, and finished off with some die cuts and stickers. For my final card, I used a cut file that I had originally intended to make a layout background. It ended up being too busy. I cut it down to a smaller size and used it as a background for the card. 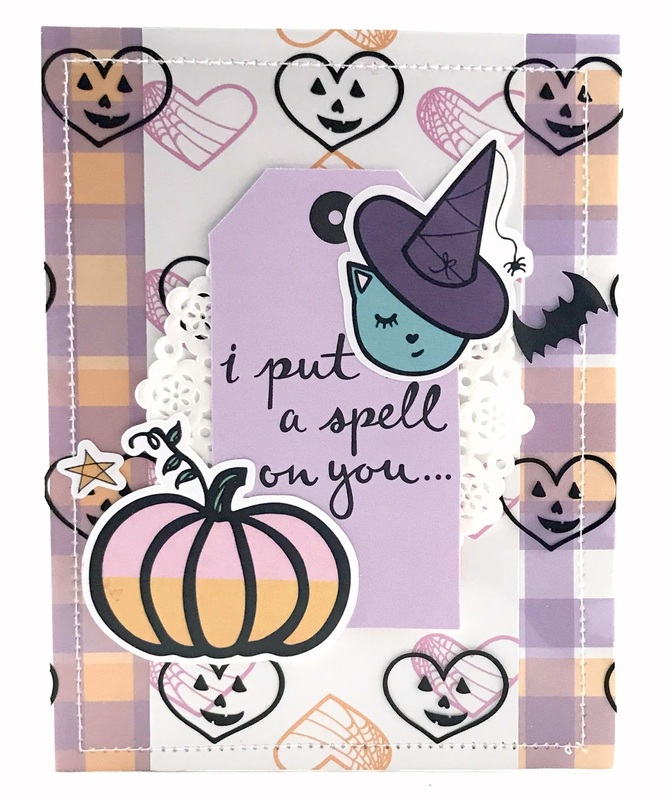 I added a tag and stickers, and the card was complete! Thanks for joining me today, I hope you have a Happy Halloween! 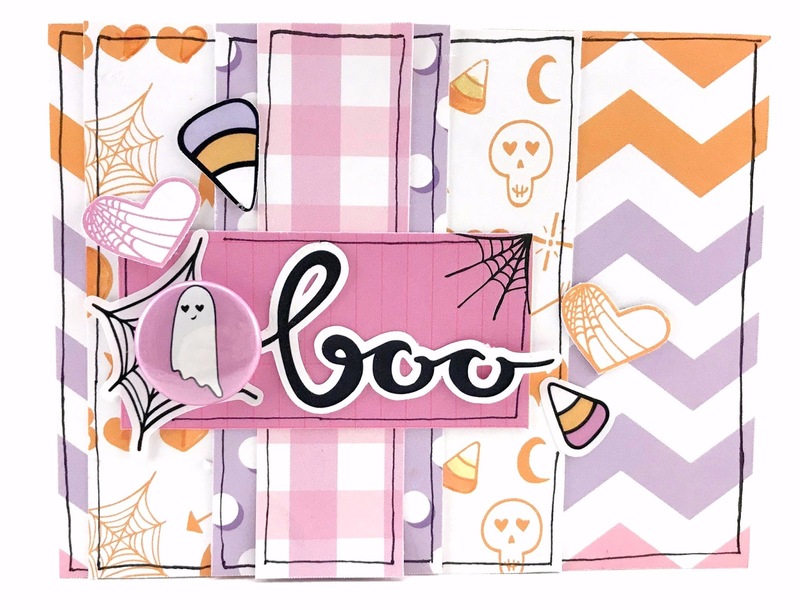 My favorites are the Halloween items and the wood veneer leaves, both of which I used on the layouts I created! 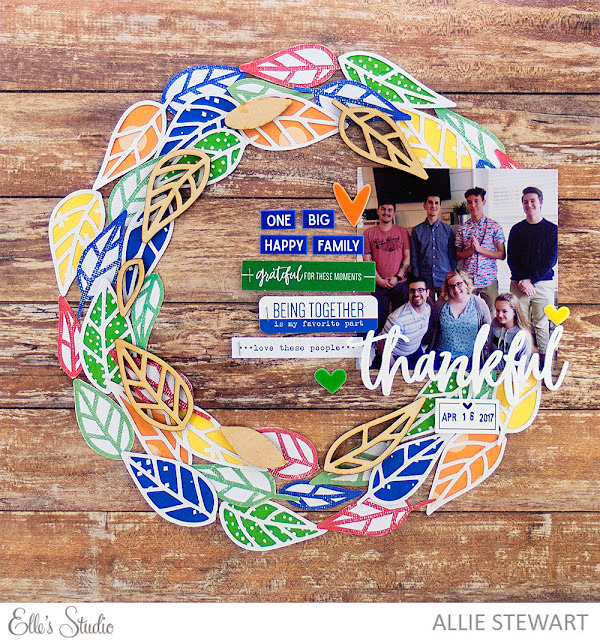 The first layout I created was inspired by all the leaves in this month's release, and the colors of the Family Fun collection. I used the stamp to create leaves of different colors. Next, I used the cut file to cut out leaves, and backed them with the same colors as what I stamped. I arranged them all the leaves in the circle, and added the wood leaves on top. I added my photo and used the acrylic "thankful" as a title. I finished with a puffy stickers and diecut phrases on the side of my photo! The result was a colorful, fall page. 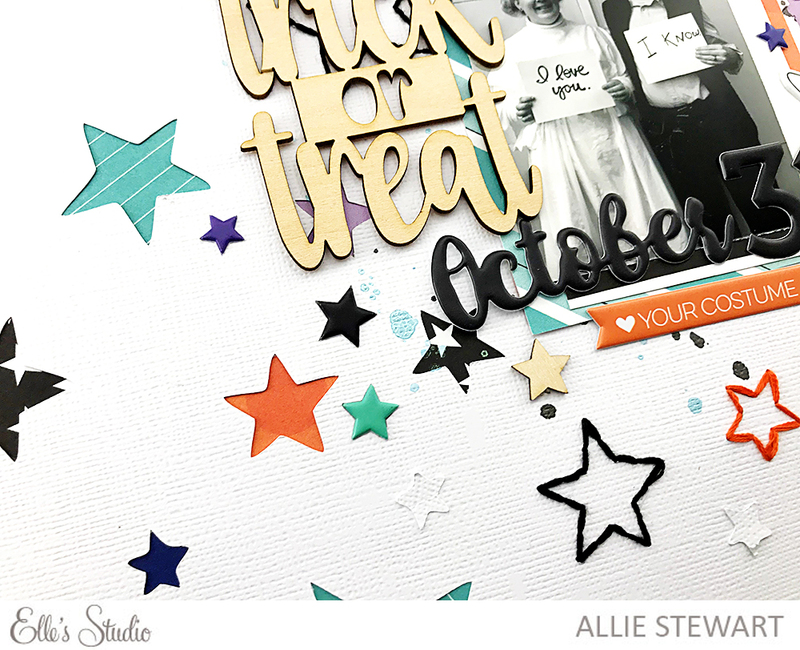 To create this layout, I started with the Star Background file. I used just part of it so the stars would be more spread out. First, I ran some of the cut file through my Silhouette with a sketch pen so I could hand stitch the stars. I ran it again, this time to cut out the remaining stars. 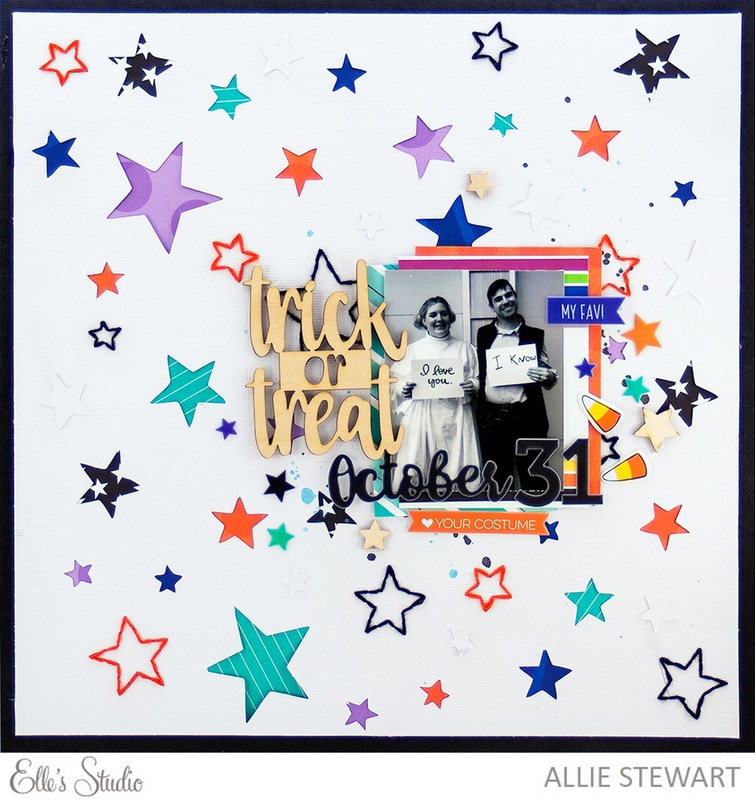 I stitched the stars in coordinating colors, and backed the open ones with the Halloween mini collection. I used the Halloween collection as layers for my photos, and embellished with the Halloween wood veneers and puffy stickers. I finished off with some splatters of mist and the layout was complete! Hello friends! I have a new layout to share for the Fairytale Club using the Take Note collection! 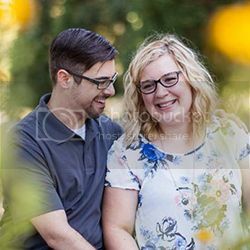 I was inspired by the "Everyday Life" piece with the castle on it, and wanted to include pictures of us at the castle during each of our three trips. I printed them out in black and white because I planned on using as many patterns of paper as possible! This layout was really easy to create! I made hexagons using a triangle punch, and arranged them cascading across my page. I added my photos and title, and then used a few fussy cut flowers above and below the photos. Finally, I finished with hearts. It was super simple and easy! Hello there! 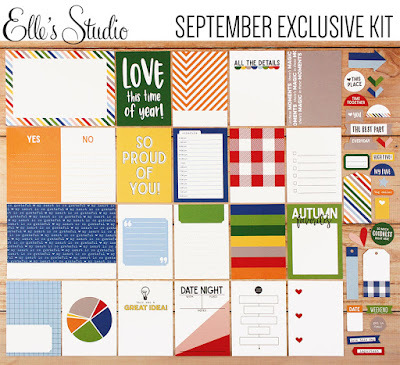 I'm here today sharing my September Elle's Studio layouts! This is an especially exciting month because it marks the release of Elle's newest collection, Family Fun! 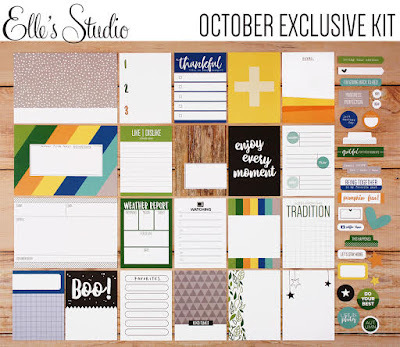 It's a great, versatile collection just in time for Fall! It also coordinates beautifully with some of the September exclusive items! I love royal blue, orange, and woodgrain colors in the collection! 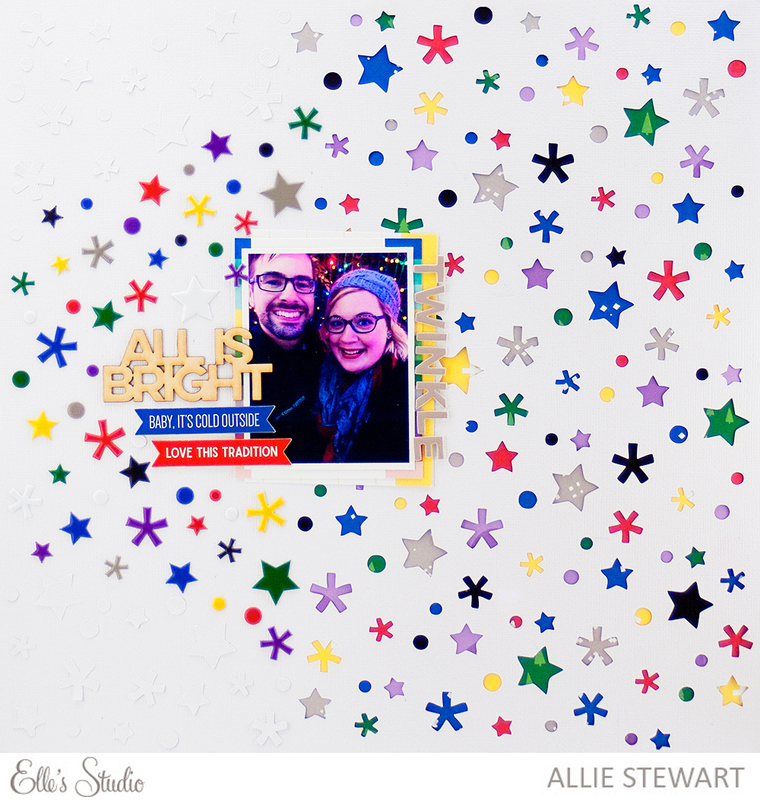 For my first layout, I created a mixed media background using the packaging technique as well as the Family Fun stamp. I used a black and white photo to stand out against the background, and added my layers. Next, I added phrases and wood veneer above and below the photo. I used this month's exclusive acrylic word "favorite" for my title. 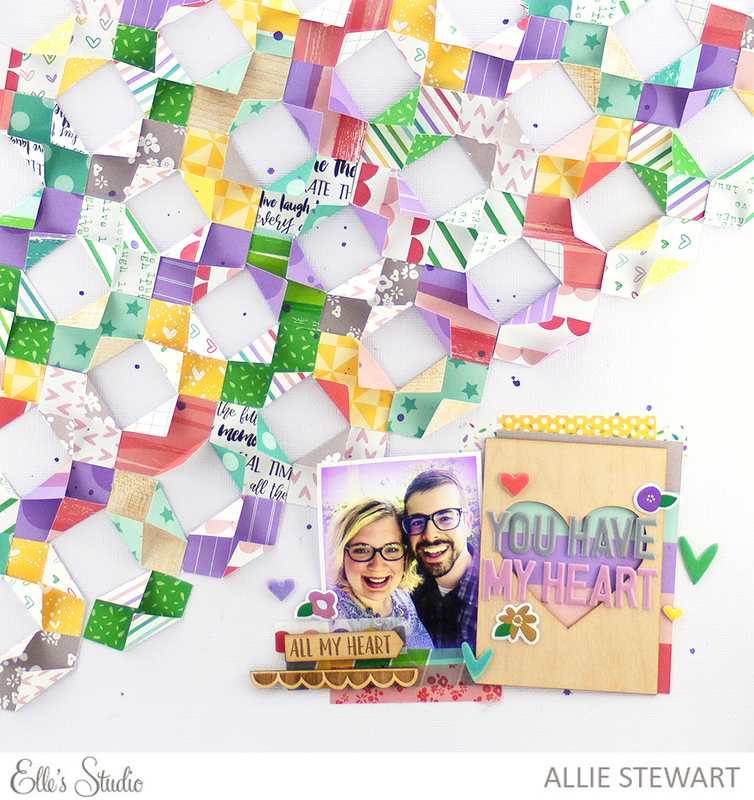 I finished by adding sequins throughout the page, and creating a little circle cluster over twine, using stamped phrases and a die cut from the monthly kit. 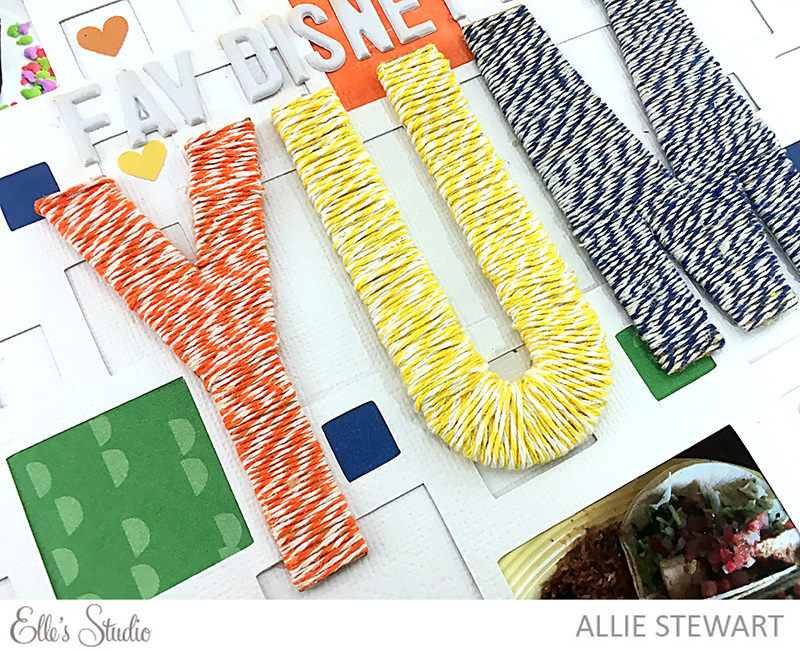 My next layout used a cut file from The Cut Shoppe! I backed some of the open shapes with paper from the 6"x6" pad, and some I left empty. The royal blue in the collection matches our Disney pictures so well, that I couldn't help using one! 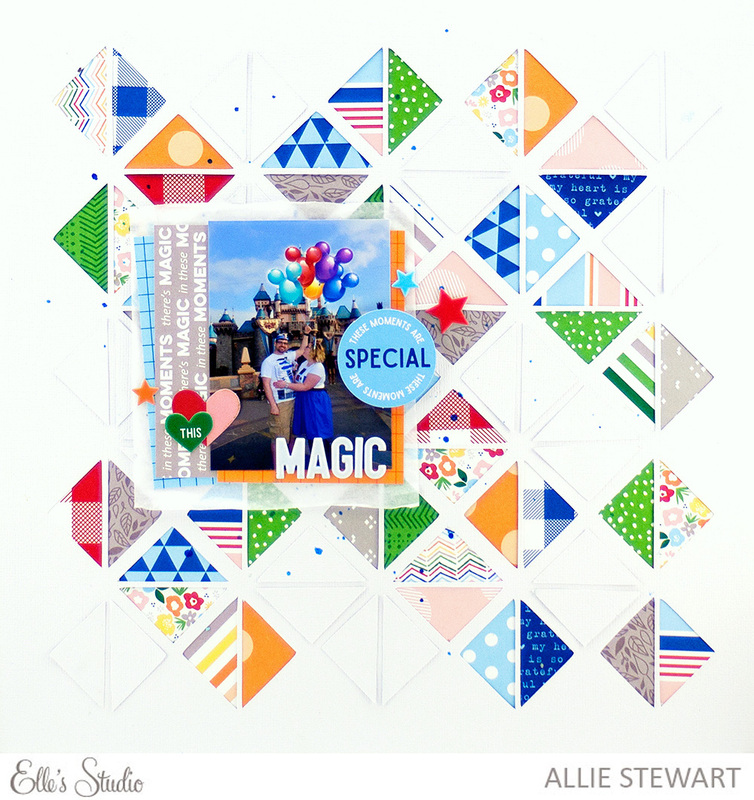 I layered my photo with journaling cards and tissue paper, and added a few embellishments from the Family Fun collection. 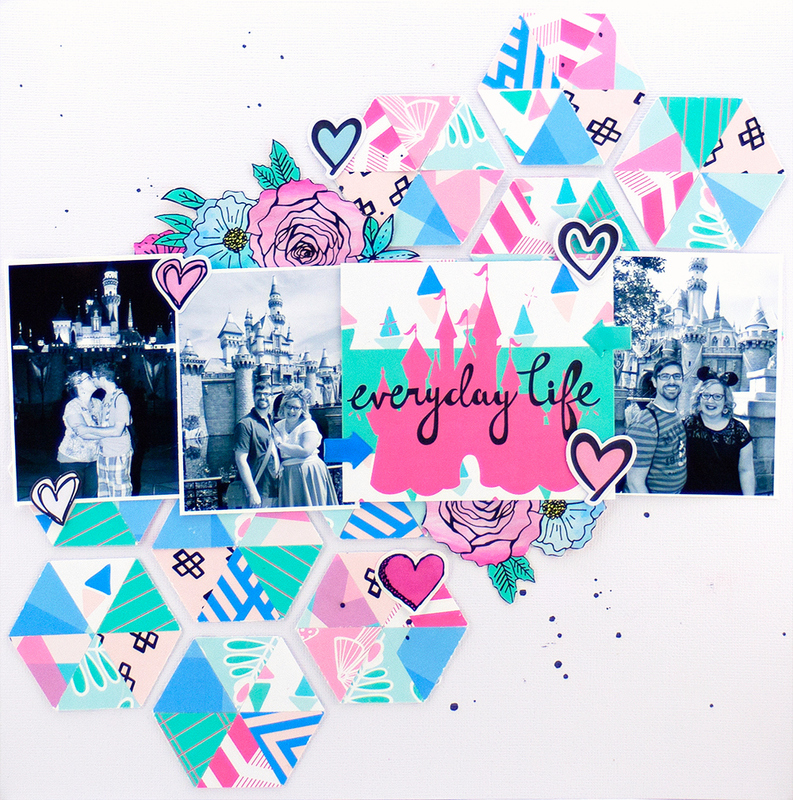 This was simple layout to create! 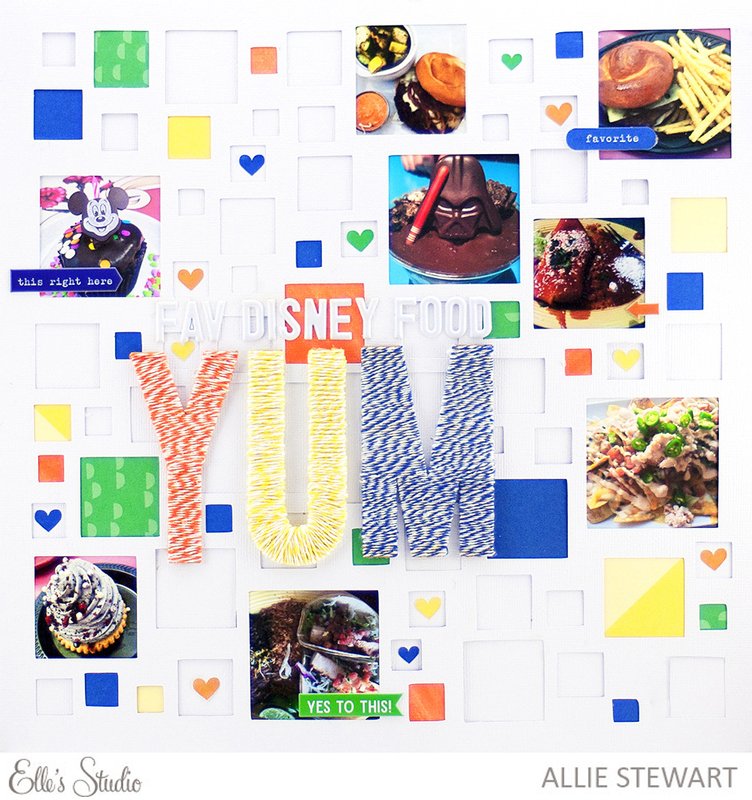 Along with the new releases I just showed, Elle's Studio is also launching foodie mini collection today! 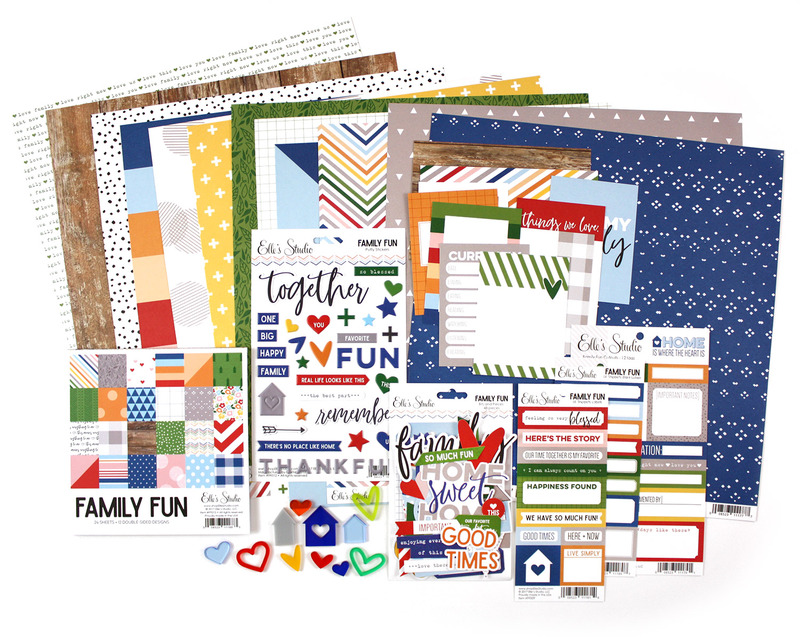 If you're interested in the Family Fun collection, there is an awesome bundle available: the along with the items being 20% off, you will also receive three free coordinating alphabet sticker sheets! 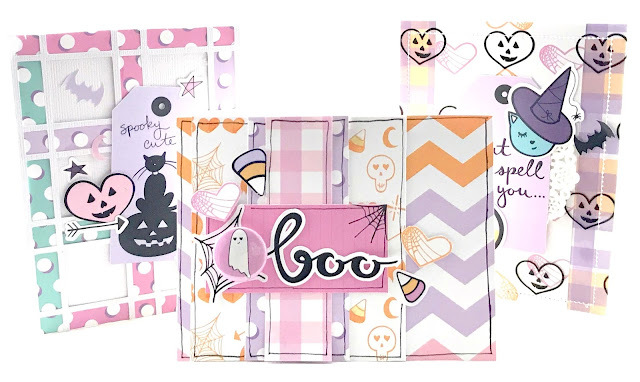 For USA subscribers, this bundle will ship for FREE when you checkout during the bundling period (International subscribers will receive a reduced shipping rate)! 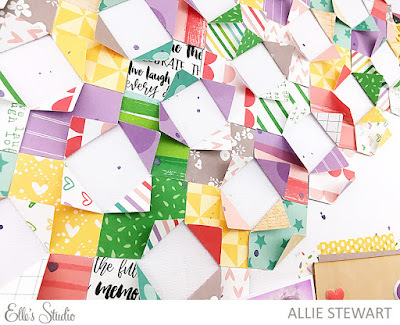 Lots of fun new things to shop for :) I hope you feel inspired by my layouts, and be sure to check out all the new releases! For the first page I created, I used the YUM wood veneer set! 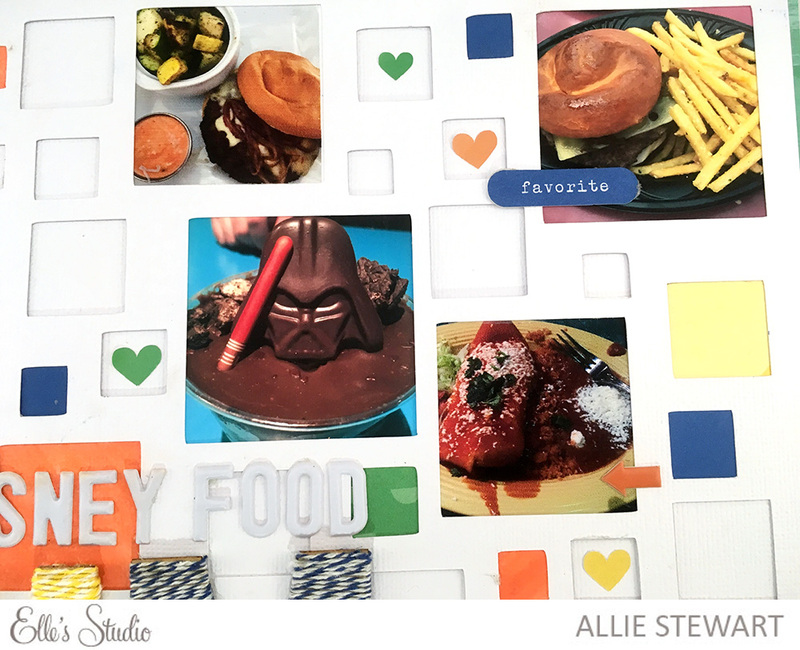 As soon I saw it, I knew I needed to do a page about all the yummy food we had in Disneyland. I covered the wood letters in adhesive, and wrapped twine around them. 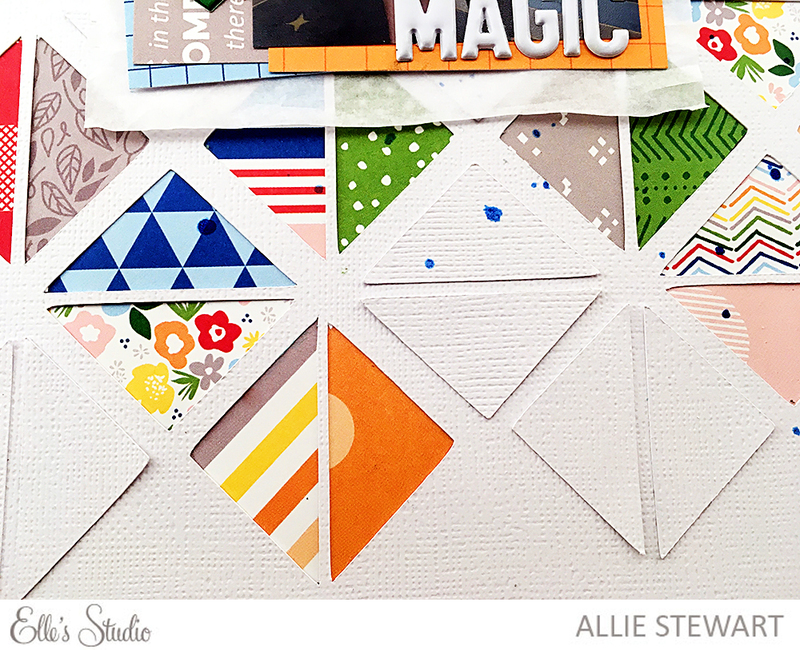 I used a cut file from The Cut Shoppe to cut the squares from a piece of white cardstock. I backed some of the squares with photos, and some with coordinating paper. TIP: I didn't have any orange paper, but I wanted to use orange in this page. I just used watercolors to paint on a piece of scrap white cardstock to create my own orange paper! I added a few puffy stickers, as well as the adorable Tiny Heart stickers, and the layout was complete! For my next layout, I used lots of papers from the Live. Laugh. Love. 6x6 paper stack. I punched a bunch of squares out and folded opposite corners of each square in towards the center. I didn't glue the ends down, because it added lots of dimension! I used the new shape to create a quilt like pattern by lining up the squares end to end. I started at an angle and diagonally created the quilt shape until it filled up most of the page, leaving white space for my photo and title. I used the heart Wood Veneer Pocket Filler to anchor my title. I backed it with a journaling card from the kit, and used puffy alphas for the title. Finally, I finished off the page with mist splatters, more puffy stickers, washi stickers, and wood veneers! 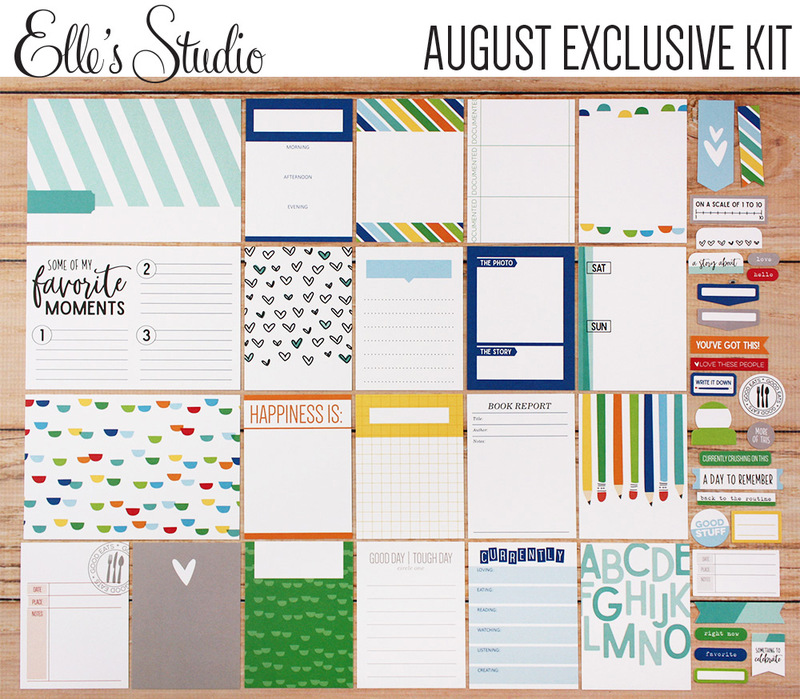 If you're interested in the August kit, don't forget about the new subscriber benefits! You get to lock in the special release day price of each kit, plus there are some awesome sale items JUST FOR YOU! Thanks for stopping by today!